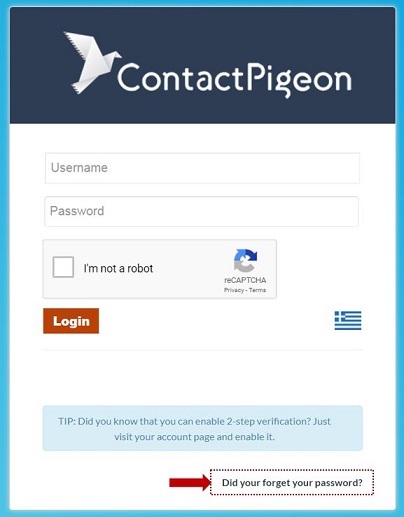 As an account administrator or user, you can change the password to your ContactPigeon account for security reasons or reset it in case you forgot. From the login screen, select "Did you forget your password?" Enter your username, and hit "Reset password". This will trigger an email with a unique password reset link sent to the email address associated with your account profile (by default). If you have setup 2-step authentication, the reset password link will be sent to the email used for the 2-step authentication. Follow the link in the email to re-enter a new password that's secure. Confirm with "Set Password". Your new password should be active. Log In with your new credentials. Still problems with your password? If you're still having trouble resetting your password or can't sign in to your account. Please contact your account manager directly, or email us at help@contactpigeon.com.